MORRISTOWN, NJ - Just like the Irish who celebrate the revered St. Patrick as the winter brings Spring, the northern European nations of Germany, Austria and Switzerland shake off the cold, dreary weather with a parade and a party during their their “fifth season.” This mid-winter celebration is Mardi Gras -- northern European style. Regionally called Fasching, Karneval, or Fasnacht, revelers dress in costume, parade through town centers, and throw candy from parade floats to children and adults and shout “Helau” or “Alaaf”. 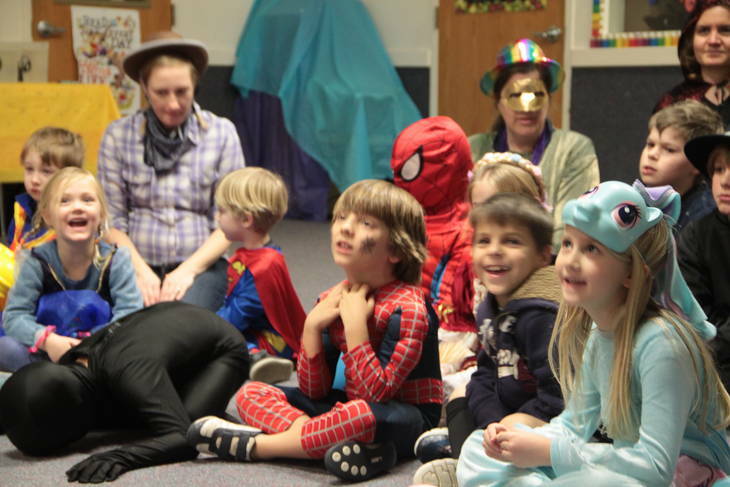 Students at the German Language Schools in Morristown, Holmdel, Princeton and Rumson hosted their own Karneval celebrations as part of their schools’ cultural programming. Just as a high school marching band in uniform with epaulettes performs for a crowd, the “Funkenmariechen” girls, dressed in red and white skirt uniforms, perform traditional dances. The principal announces the Prince and Princess who “rule” their “subjects” back home for the duration of the Karneval season. Parents provide treats that can include traditional Krapfen, a sweet treat akin to doughnuts. Historically, Carnival or Fasching officially begins on November 11th at 11:11 am and continues until the day before Ash Wednesday, the traditional start of the Lenten season, with only a break for Christmas. For some people, Carnival represents good and evil with costumed attendees wearing happy and angry masks to signify the happiness of the approaching spring and/or to ward off the dark, evil spirits of winter. No matter how it’s celebrated, the end of Carnival means that spring is fast approaching. For more information about this event and activities of the non-profit German Language Schools in Holmdel, Morristown, Princeton and Rumson, visit us online at www.njlearnsgerman.org and socialize with us: Facebook, Meetup & Twitter.